If you license or publish images, this guide is as indispensable as your camera. 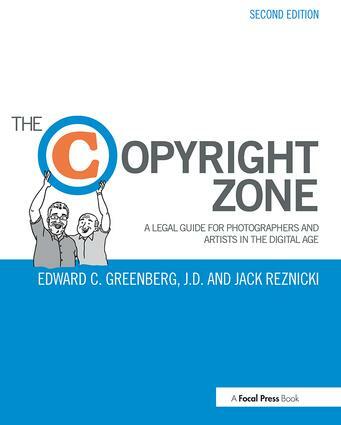 It provides specific information on the legal rights of photographers, illustrators, artists, covering intellectual property, copyright, and business concerns in an easy-to-read, accessible manner. The Copyright Zone, Second Edition covers: what is and isn’t copyrightable, copyright registration, fair use, model releases, contracts and invoices, pricing and negotiation, and much more. Presented in a fun and easy to digest style, Jack Reznicki and Ed Greenberg, LLC help explain the need-to-know facts of the confusing world of legal jargon and technicalities through real world case studies, personal asides, and the clear writing style that has made their blog Thecopyrightzone.com and monthly column by the same name in Photoshop User magazine two industry favorites. The second edition of this well-reviewed text has almost doubled in size to ensure that every legal issue you need to know about as a photographer or artist is covered and enjoyable to learn!